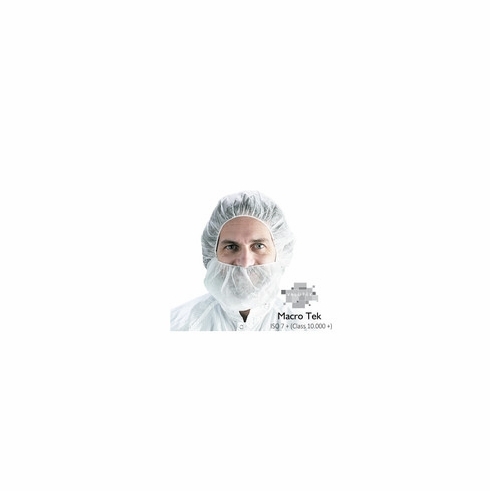 Valutek's disposable SPP beard cover is manufactured with 100% non-linting, non-woven, spunbond polypropylene fabric, which provides comfortable operator protection. The beard cover has a filament covered, unexposed elastic band for secure fit and closure. All Valutek beard covers are tested and manufactured in ISO compliant facilities under individual inspection and strict process control to ensure Valutek quality standard and product specifications. As part of the Valutek Macrotek product family, this product is recommended for use in a cleanroom Class 10,000+ (ISO 7+) critical environment.